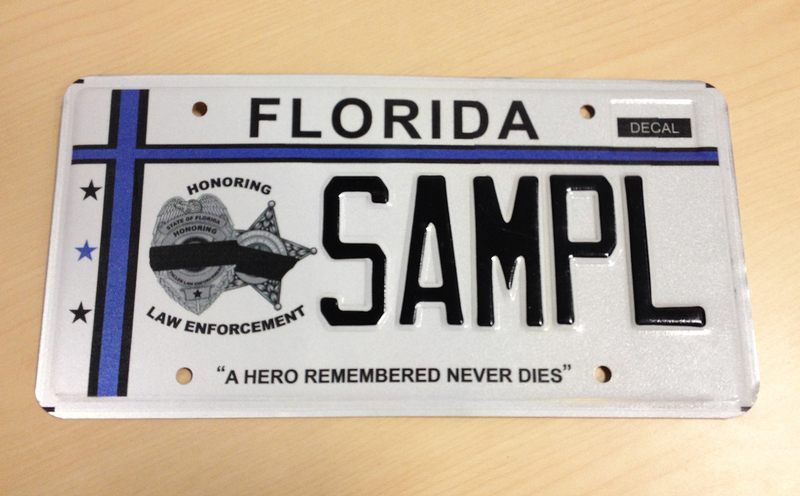 A few weeks ago, a colleague brought in a sample of the Florida Fallen Law Enforcement Officers Specialty License Plate. A non-profit called the Police and Kids Foundation, Inc. is promoting the presale of these tags. Their goal is to presell 1,000 of the tags in 24 months to qualify for production and distribution. After about three months, the total thus far is about 290. “The Police and Kids Foundation, Inc is a non-profit 501( C) 3 charity that has been set up with two objectives in mind. First are the immediate needs of a child that we determine is in need of help. The Police and Kids Foundation, Inc. may provide funding so responding officers may purchase items required to help the child in need. This assistance will be determined by the responding officer but may include food, infant supplies, clothing or obtaining a replacement to lost, stolen or damaged property. The ultimate goal is to stabilize the situation quickly with as little trauma to the child as necessary. The Police and Kids Foundation, Inc. may also use funds to support other organizations that support our goals. Good day, my name is Jonaleah Carrow. I attended Pinellas Park High school and am part of Operation 10-24. My graduating class and I have worked four and a half years to design a license plate, collect support from Florida law enforcement and congress Representatives for the plate, and pass a law to memorialize fallen law enforcement. This journey all started our freshman year in 2010 when we completed our yearly project of studying a fallen officer and creating a nice project to memorialize the assigned officer. Two months later our local area lost three officers in Saint Petersburg’s Police Department and one officer in Tampa’s Police Department. From here my class came together to brain storm a way we can memorialize them and every other officer that risked their lives for us, meanwhile find ways to keep these accidents from happening to officers to come. From this brainstorm we created the license plate, passed a law and as of October 1st we now have them for presales. All proceeds from the sales of the plates will go to three different areas. First, we will put money towards purchasing the safety equipment needed that some departments don’t have funding for. Second, training classes to teach officers how to stay safe and us their equipment correctly. Third, we will also put money towards high schools and other academy’s like the one I attended that helps teach the up coming future law enforcement officers. We have a board that is put together that will begin contacting police departments in regards to the funds raised. In this email I attached one of our fliers. In order to purchase a tag you head to your local DMV for presale purchase. Once a thousand presales are sold we will begin to see the tags on our roads. I thank you for your time and hope you can assist us by spreading the word in your department and help us honor those that have been in your position before passing. Funding from the proceeds of the license tags will be used by the foundation for police training, equipment, and education. If this interests you, you can preorder through the DHSMV at local county tax collector offices or license plate agencies for $25.00 plus registration fees. This entry was posted in Misc., Off Duty. Bookmark the permalink. I,m in I love it!!!! Most excellent. If I lived in FL, I’d be all over this.